The Judge from Taurus® has emerged as a very popular handgun for Personal Defense®. This specialized gun has been without a specialized load-until now. 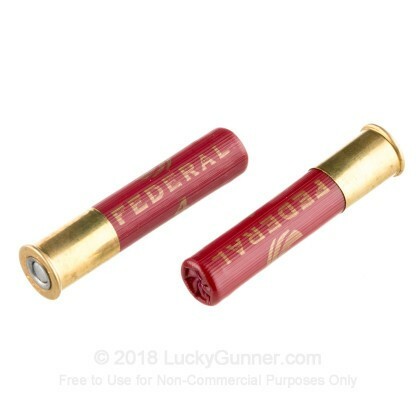 Federal has introduced two 2-1/2" loads (buckshot and #4 shot) designed especially for The Judge. A special hull design and optimal payloads make these loads perfect for this gun. 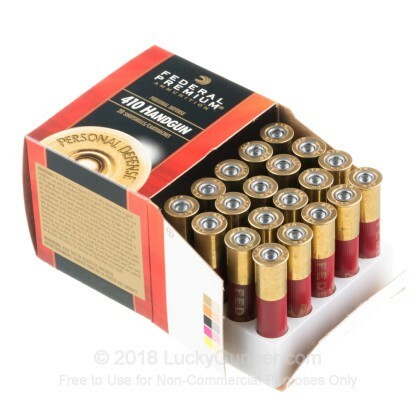 This product is the 7/16-oz #4 shot load. 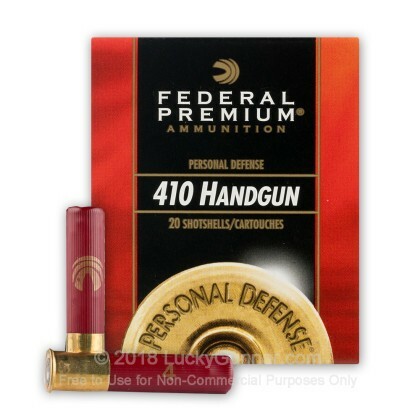 If you shoot The Judge or any other 410 self-defense weapon, be sure to make your shots count with this special self-defense load. One shot can make the difference. I bought this thinking perhaps Federal had solved the rapid spread of birdshot coming out of the Judge. 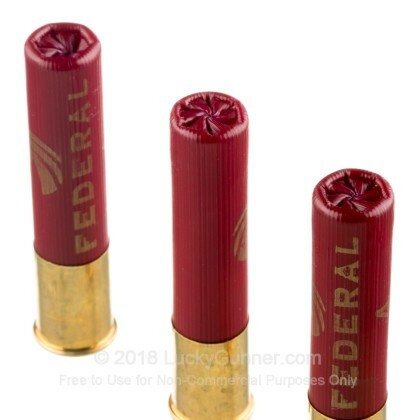 I think their 000 buck is great and I love Federal bullets. But in this case I had better results with Winchester's 3' shell in the same shot size. First of all, the Federals did not load smoothly. But the bigger problem was the spread was very wide at 15 feet. I scored 26 pellets in a 12"X16" target at 15 feet. Naturally the 3" shell had more pellets to throw and I scored 49 hits on the same size target at the same distance. 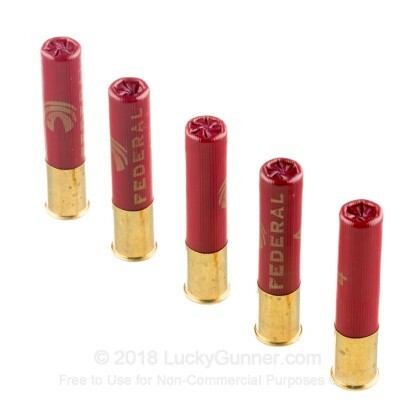 I paid $4 more for the Federal and got 5 less shells compared to what I paid for the Winchester 3". The Winchester shells also loaded without any hangups. Love shooting this ammo. Works flawlessly in my Rossi 410 shotgun. Other ammo would not eject but federal performed without a hitch. Very tight grouping. Can't wait to try it in my new governor! Absolutely fabulous service from lucky gunner. Ammo/products delivered very quickly and accurately! Works GREAT in my new Smith & Wesson Governor! They worked flawlessly in my new Smith & Wesson Governor. At 7 yards the grouping is quite tight. All fired great! I was amazed at how quickly Lucky Gunner got them to me! Thanks "Lucky Gunner Crew!" I am a new fan! Q: Is this 4 buck, or #4 birdshot? I had fired 4 buck and was not impressed. I am interested in #4 birdshot, however. Thanks! 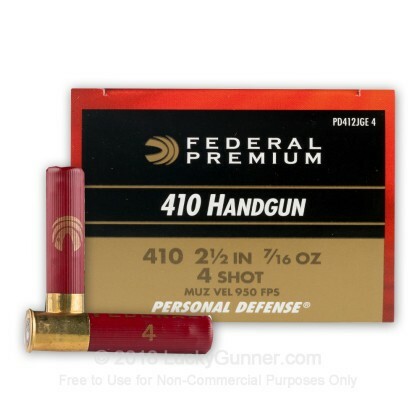 We also have this 410 Bore - 2-1/2" #4 - Federal - 200 Rounds ammo in stock in a bigger quantity.